2007-2014 | The existing Zuid-Willemsvaart canal in ‘s-Hertogenbosch was extended with the new, seven kilometres long Maxima-canal. Construction company MNO/Vervat (Boskalis) won the Design & Construct contract for a new concrete railway bridge crossing the canal and a new under passage. The concrete structures of both the bridge and the underpassage are finished with a mosaic inspired on a painting of Jheronimus Bosch: Garden of Lust (Museo del Prado). 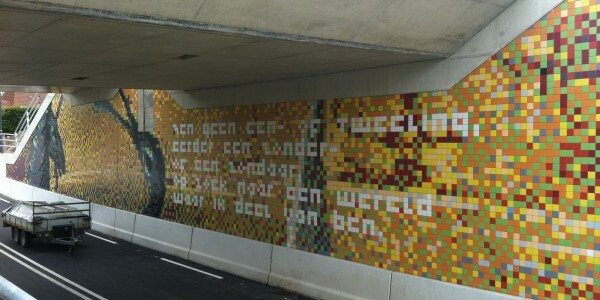 The bridge shows a fragment of ‘heaven’, the underpassage a fragment of ‘hell’ and a poem by Amsterdam poet Abel. The mosaics contain over a 100,000 coloured Villeroy & Boch tiles.